Imagine if instead of Steven Spielberg, it was someone like Francis Ford Coppola or Michael Cimino or even Badlands-era Terrence Malick who directed Raiders of the Lost Ark. That’s not to say that The Lost City of Z retains the fun adventure and spirit of Indiana Jones’ screen debut, because this is a grounded, haunting, sometimes disturbing movie that really dives deep into the psychology of its central explorer and offers a rich and intriguing study of why someone would essentially risk their life and mental well-being just to discover untold truths of the ancient world. With Coppola currently MIA from filmmaking, Cimino having passed away, and Malick tripping out on his own artistic pretentions, it falls to writer-director James Gray – a filmmaker who to the best of my knowledge has not had any of his films be given a UK cinematic release (please correct me if I’m wrong) – to deliver the goods, and as suggested he has made a film that is rich with detail, both in its visuals and its emotional core. The film focuses on the life of Percy Fawcett (Charlie Hunnam), a military man in 1905 ridiculed by elitists for his “unfortunate choice of ancestors”, who is recruited by the Royal Geographical Society to head a map-making expedition to South America, along with his cohort Henry Costin (Robert Pattinson, unrecognisable underneath his luxuriant beard). On his near-fatal journey that involves piranhas, local natives, and more facial hair than a barbers’ convention, Fawcett comes across evidence that points towards an ancient civilisation deep in the Amazonia, and dedicates the rest of his life and career to uncovering its existence once and for all, leading up to a fatal venture in 1925 which sparked several theories and conspiracies about its mysterious aftermath. 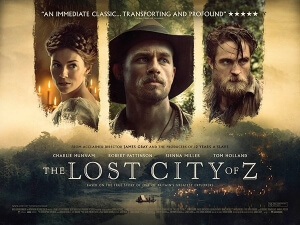 If you know the history behind Fawcett and his unknown epilogue, then The Lost City of Z might be somewhat of a drag for you (and at 140 minutes, it can be so even if you don’t know much about it). But for the most part, it was interesting to watch this very grounded, very gritty type of epic film that is rarely ever made anymore; Gray definitely takes inspiration from epics of the 60s and 70s to tell his cinematic story, giving it a classical feel which doesn’t take anything away from the complexity of the emotions or the main character’s dangerous obsession. From the moody but stunning cinematography to the breath-taking orchestral score, the film really takes its time to establish the world and harsh environments it sets itself in, including not just the deep Amazon jungles but also the trenches and battlefields of the Somme during the First World War, or even the posh and sophisticated buildings back in London which feel almost as uncharted and terrifying as the endless wilderness in some scenes. Hunnam does fine work here as Fawcett, as he gives the character enough charisma and emotional ferocity to make you want to follow him deep into the jungle, but also respect and admire him as someone who has this fierce passion for seeing the world. Pattinson and his fine beard also does well, though often he can feel like he’s fading more into the background as the film goes on, though it’s not like he’s meant to be our lead in the first place. Sienna Miller may be stuck in yet another thankless “wife” role following Foxcatcher and American Sniper, but at least here she’s given a fair bit more to do than just support her on-screen husband Hunnam and that’s it, and she carries her own scenes with a strong amount of emotion and intrigue; and special mention too must go to new Spider-Man Tom Holland as Fawcett’s eldest son Jack, who in the small amount of scenes he does have still manages to show off just how damn good an actor he really can be. It’s the kind of film that will intrigue some people but not everyone, and in some respects I can understand that – after all, it is perhaps a bit too long and it does tend to drag in some parts. But if you decide to stick with it, you certainly won’t be let down by its sheer cinematic force, from its gorgeous production values to some solid acting, that makes it a near-classic from a bygone era that is only now finally resurfacing for audience to experience. The Lost City of Z is a gorgeously-made alternative to the big-screen adventure movie, one that explores more complex human emotions like obsession with grace and humanity, along with solid performances and strong production values that carry you all the way through its extended running time.